Soon after they arrived at the restaurant and sat down, Primero read Kotomi's text. He tried to bang out a reply, his hands under the table. To his horror, he realized that he forwarded Tomoko's text from the day before. AT PUB GET HERE NOW. He went to send another. The largest, most muscle bound guy in school was a bumbling mess. "Told ya." She took that as the opportunity to grab his phone. Quickly, she typed her contact information. She handed the phone back to him. "I'll check on you in a few hours. I have some errands to run." Kotomi had no luck trying to get people to rejoin the team. But people kept telling her that the team's misfortune was due to a curse. Nobody wanted to tell her what the curse was; they just cut her off when she asked if they wanted to join her team. The injured girls did not want to return for the same reason. She remembered there was a goth girl that had tried out last year, the same time she did. Blonde girl from America. Amy's family restaurant was one of Kotomi's favorite places. But it almost lost all its clientele when somebody accused them of being the front to a child trafficking ring. It made all the papers, even overseas. Her father countered by having a free food day, with tours of the kitchen. Few came, but the regulars were starting to return. The cleaning girl looked familiar. It only took Kotomi a minute to make the connection, as there were few blue haired girls in town. "Could you take her broom for a minute? I want to check something." 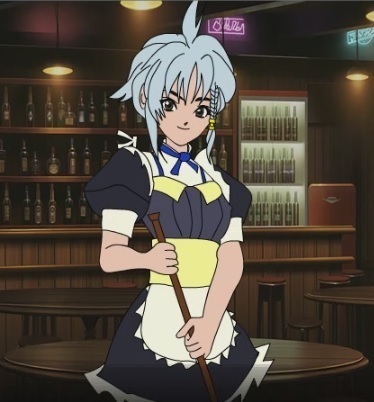 Kotomi went over the counter and grabbed two ornamental clubs that hung on the bar behind the register. "Can you still use these?" Kotomi looked into Karin's eyes. "Girl, we need you. Show me what you can do." kotomifan It suited the story this time. But yeah, she needs to do more.